Well, I made it to Silicon Valley for CFP, and am looking forward to what will no doubt be both an intellectually stimulating conference and impassioned opportunity for civil liberties activism. The Social Network Users’ #BillOfRights effort couldn’t be more exciting or timely, which Get FISA Right is proud to support. 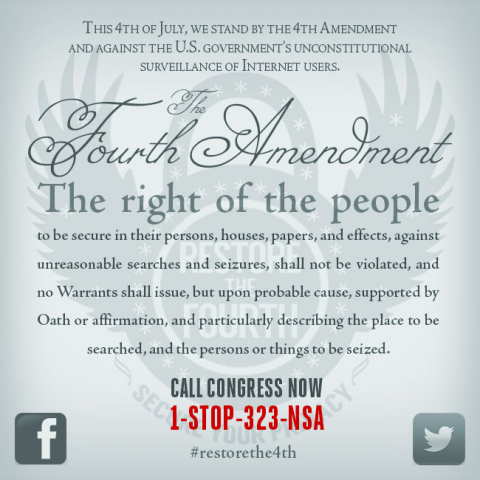 Furthermore, we will be presenting about Get FISA Right’s history and the road ahead in a joint power point with Shahid Buttar of the BORDC during today’s Activism and Social Networking: Advocating for Online Privacy panel which will be streaming at 1:15 PM PST. You can find an embedded version of the power point below, otherwise, check out http://www.cfp2010.org for more details, and tweet to the #cfpconf tag as your tweets are displayed in real time to attendees! View more presentations from Computers, Freedom, and Privacy conference. As excited as I am about representing the Get FISA Right community at the Activism and Social Networking: Advocating for Online Privacy panel, I am particularly looking forward to helping prove that the Computers Freedom and Privacy conference really is the perfect place to create a Social Network Users’ #BillOfRights. Over the course of the conference, we’ll collaboratively draft a proposed Social network users’ bill of rights and circulate it broadly online for discussion and feedback. Panels like Privacy and Free Speech: it’s good for business, Privacy choices online, and Can an app do that? discuss the underlying issues, and the Unconference on Wednesday provides an opportunity to explore specific topics in more detail. We’re also adding a session to focus specifically on the bill of rights (probably on Tuesday afternoon); details TBD. In a Birds of a Feather session Thursday night, we’ll finalize the wording, and ask for help translating it into different languages and posting it throughout the blogophere as well as on Facebook, MySpace, Yahoo!, tribe.net, Buzz, and elsewhere for discussion. At the Friday afternoon plenary, Professor Dorothy Glancy will lead a session of debate and voting, streamed live over the internet with a Twitter backchannel. So what rights do you think social network users should have, and what would you do to achieve them? Joining the CFP Facebook group. Coming by the #BillOfRights Twitter chat at 7 p.m. on Thursday. I have to admit, I’m more than a little excited for the Computers Freedom and Privacy conference starting next week! Much more to come about specifically how Get FISA Right will be involved, but for the moment, I’d like to involve our community on a particularly pressing matter, namely, the presentation I will be giving during the Activism and Social Networking panel on Tuesday. I spoke with Jon (who is co-chairing the conference) the other day, and we have come up with some broad strokes for how it will work, but there are many details that we would love your help filling in. We decided to conduct our portion in a back and forth exchange with Shahid Buttar of the BORDC , as we will utilize a joint power point presentation to lay out our past successes, and then bridge back to where we are going together—especially how we are combining on the ground and online efforts as part of the local model legislation initiatives effort they are leading. Where I could most use help is discerning the specifics of both what I’ll be talking about and what will show up in the slides (which will be available in real time if you care to watch). Assuredly, we’ll be focusing on the original My.BarackObama.com group gaining a large following, and how we collaborated to create an open letter, leading to our mainstream media coverage and Obama’s unprecedented response to the group. We will quickly discuss our recent efforts, as well as our trials and tribulations, and we can describe how we have dealt with communications challenges by employing a meeting-centric strategy (catalogued extensively through transcript-style notes) to keep the group together enough to lead similar efforts in the future. This is a point of pride, although we may not spend too much time on it, as there are no other current groups that can take the lead in doing what we do, and we all should be proud that we have maintained this capacity! Yet, it is precisely this capacity that is such a key point of conversation, as we’ll be utilizing our credibility to make recommendations for where we go from here. In particular, we will go over the social media toolkit we are building to complement BORDC’s on the ground efforts, and we’ll have many more details on this (especially how you can help construct it) soon enough. Get FISA Right by its nature is a collaborative enterprise, so please, let us know what you think—both about the broad strokes as well as the specifics. Let’s make sure this will be a panel to remember! You are currently browsing the Get FISA Right blog archives for June, 2010.